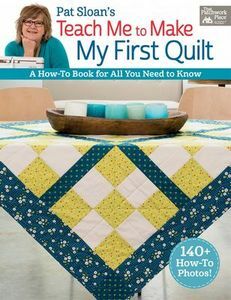 In the fourth book in her popular 'Teach Me' series, expert teacher and quilt designer Pat Sloan guides you through each and every step as you make your very first quilt. Pat's easy-to-follow instructions and more than 140 clear how-to photos make it fun to start, stitch, and finish nine classic blocks and nine simple quilt projects -- even if you're an absolute beginner. Learn the basics, from selecting notions and cutting fabric to machine sewing to quilting and binding, all from a skilled instructor with a warm, patient teaching style. You'll be proud to finish your first quilt, the first of many! Softcover, 96 pages.